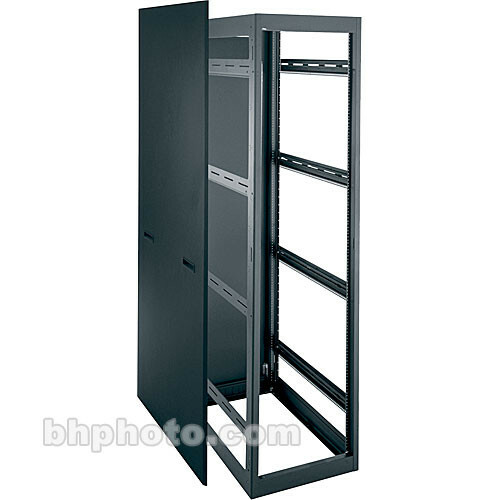 House your equipment with the Middle Atlantic MRK4436 19 x 33 x 77" 44SP Rack with Rear Doors. This rack securely and attractively holds your expensive equipment with fully welded construction, 14-gauge solid steel tops and bottoms, and 16-gauge solid steel sides. And the narrow design is good for large scale, multi-bay jobs. The configurable top accepts a number of top options while the bottom features an installed grounding and bonding stud. And the interior gives you more room with two pairs of wider rackrails. Middle Atlantic really knows how best to hold your equipment and provide you the security you trust and the features you want. Fully welded construction provides 2500 lb weight capacity and when used in conjunction with the MRK-Z4 brackets the MRK is even seismic certified for up to 1000 lbs of essential equipment. This rack is built to last and withstand a lot of abuse. It is built with solid sides made of 14 gauge steel on the top and bottom and 16 gauge steel on the sides with fully welded construction. If you're in the United States or Canada then you'll be happy to know that this item is UL Listed. The bottom of this unit comes with a grounding and bonding stud already installed. The interior opens up to give you even more room with two pairs of wider rackrails. There is a number of top options available to you with the configurable open top design. Box Dimensions (LxWxH) 89.0 x 39.0 x 27.0"